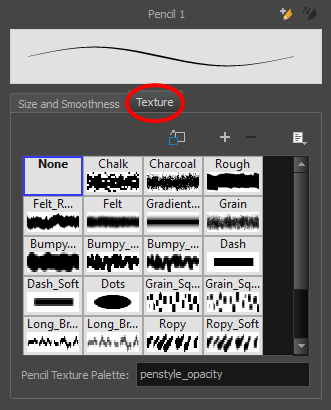 In the Tools toolbar, select the Pencil tool or press Alt + /. In the Tool Properties view, the preview area displays the stroke that will be produced after you customize the different parameters in the Tool Properties view. Click the arrow button. The Pencil Properties window opens. This is where you set the minimum and maximum sizes of your drawing tool which will produce the thick and thin effect on your stroke. This works with the pressure sensitivity of a pen tablet. Maximum Size Sets the maximum width of the line. Minimum Size Sets the minimum width of the line in relation to the maximum size. 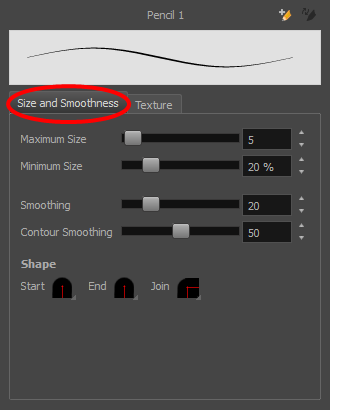 Smoothness Lets you modify the central line smoothness of the line. This parameter smooths the initial movement of your line. Increasing the value will result in a smoother line with fewer control points. Contour Smoothness Optimizes the contour line smoothness of the line. This parameter will smooth the contour of the line once it has been traced; the higher the value, the fewer control points will compose your line. You can adjust the start, end, and joint style of a pencil line. Start: Lets you select the style of the start tip, which is the first tip you drew. You can choose between Round or Flat style. End: Lets you select the style of the end tip, which is the last tip you drew. You can choose between Round or Flat style. Join: Lets you select the joint style. The joints are where the line curves abruptly. You could also define the Join style as the corner style. You can choose between Round, Mitre and Bevel style. Texture See About Pencil Line Texture.